Lava issuing from the current eruptions at Kilauea have started a third ocean entry (and the second within the Hawai’i Volcanoes National Park). The entry is not as dramatic as some, forming a slow, dripping entry of lava into the ocean (see linked video footage), but every little drip adds a little more land to the big island of Hawai’i. In some other Hawaiian volcano news, the USGS have also posted a video showing the filling and draining of the lava lake in Halemaumau that started last year. Usually, the crater was surrounded by steam and fumes from the degassing magma, but the thermal camera pierced the veil to show the lava rising and falling within the crater. 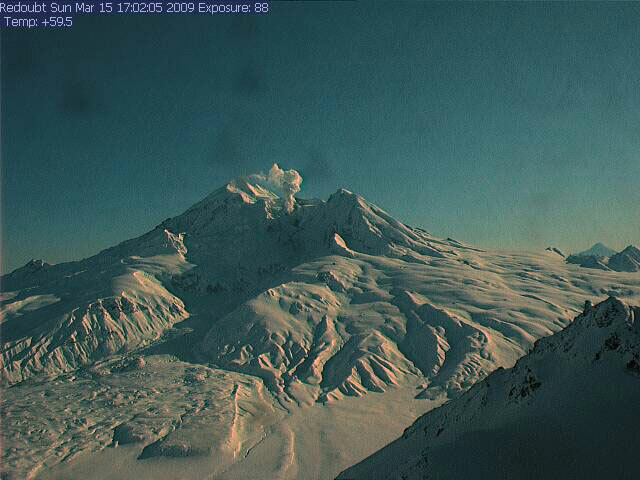 A quick note (as I’m buried in zircon): The Alaska Volcano Observatory has installed a webcam at Redoubt to monitor for an eruption. It is a little cloudy today (not the image above), so not much can be seen, but who knows, maybe you can catch the volcano in action if it erupts. The status remains at Orange (heightened risk of eruption) and AVO will monitor the volcano around the clock until things change (eruption or return to background). UPDATE (11:34 AM): Just as I posted this, I saw a very brief article that mentions something I hadn’t heard before: AVO has noted some muddy debris flows along the glacier that is downslope of the summit. This might suggest that things are getting warmer near the vent as the magma ascends in the edifice. Things might begin to move quickly at Redoubt. I’ve found a few more details about the ongoing activity at Huila in Colombia, including a video report from the BBC. 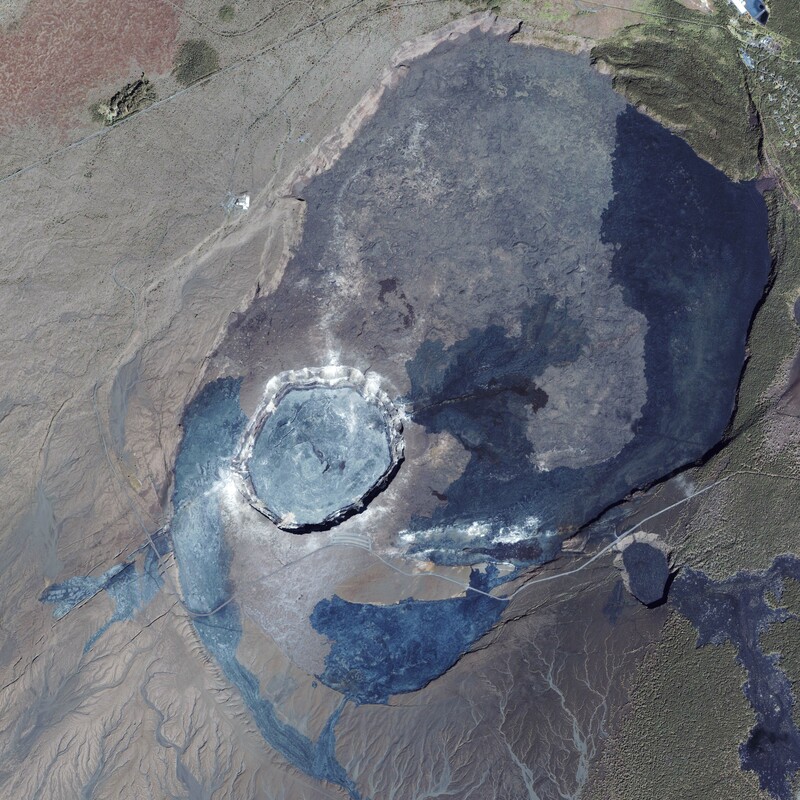 It seems that the eruption at Huila is a photocopy of what happened at Nevado del Ruiz in 1985 in its style: hot ash and gasses erupted from the crater melted ice/snow near the summit to create a lahar – a deadly mix of volcanic material and water that ends up like a surging flow of liquid concrete. 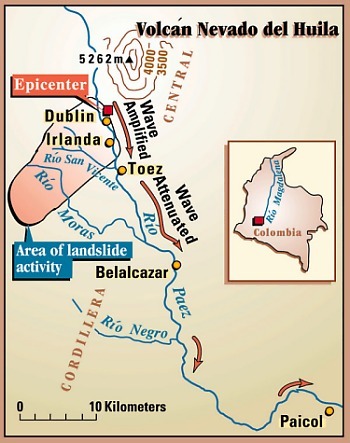 The lahars travelled down the Rio Paez valley (see linked map – the landslide on the map is not volcanically related). Beyond the unfortunate victims caught in the mudflows, many roads and bridges have been damaged in the area near Belacazar. However, the BBC video does mention that many people were, luckily, given sufficient warning to escape the lahars – about an hour according to the man in the video – and resident went uphill to escape the flows. The death toll might be much lower than it could have been, a testament to how far Colombia’s volcano mitigation has come since the 1985 disaster. The headline for this entry sounds more dramatic than it is, but one of the last structures in the ill-fated Royal Gardens subdivision on the big island of Hawai’i finally met its fiery demise over the weekend. For those of you unfamiliar with the plight of the subdivision, Royal Gardens is part of Kalapana, and it was unfortunately situated quite close to the Pu’u O’o rift that has been erupting since 1983. Most of the subdivision has been overrun by lava flows since then, but one of the last two structures still being used was done in by the basaltic lava. The first link has a great map showing the October lava flows and where they have gone, along with some stills of the flows overtaking the house (in the video). On Sunday afternoon, a large ash eruption occurred at Halemaumau Caldera at Kilauea. Not only did the volcano belch more grey ash than usual, but also red-hot incandescent material can be clearly seen being thrown from the vent during the vigorous eruption. The coolest thing about the eruption is that it was all caught on film by the USGS/HVO. Take a look (at three times speed) – this video is from the morning of October 12, but there are a series of video from the whole weekend on the website. Not sure how it was kept quiet for most of the week (well, at least to me), but geologists at the HVO have noticed a new lava lake in Halemaumau Caldera on Kilauea (Hawai’i). The lava lake is around 330 feet (~100 meters) below the crater rim and ~160 feet (50 meters) across with sections of reddish, glowing lava and black crust on the surface. It seems that an explosion on Tuesday helped reveal the lava lake from the surface. The USGS has posted some video of the lava lake for your enjoyment. There are only a few active lava lakes worldwide (such as those at Villarrica in Chile and Erebus in Antarctica), so it is always exciting when a new one forms. The longevity of lava lakes is controlled (partially) by the supply rate of magma to the vent area, so it will be interesting to see how long it lasts. been able to get visual confirmation until this morning. the past 5.5 months, most recently on September 2, 2008 at 8:13 p.m.
except for brief pulses of glow. 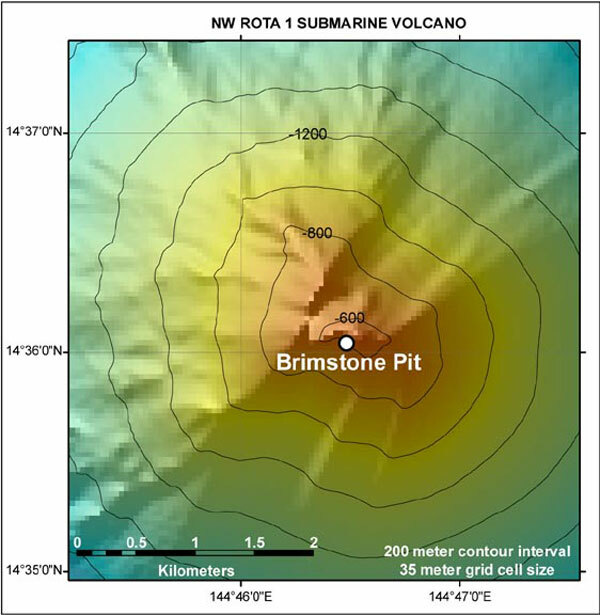 have been observed at least 20 times since the Halema`uma`u vent opened. magma levels beneath the summit. pieces of evidence pointing toward a gas pistoning source. provides excellent views of the glowing vent at night.